Livingston captain Craig Halkett has admitted it’s a “compliment” to be linked with a move to Hearts. 09/03/19 LADBROKES PREMIERSHIP'LIVINGSTON v ST JOHNSTONE (3-1)'TONY MACARONI ARENA - LIVINGSTON'Livingston's captain Craig Halkett. 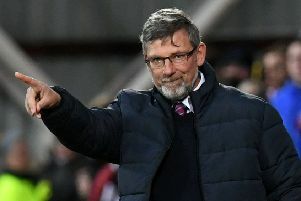 The centre-back is reportedly on Craig Levein’s shortlist of prospective new signings this summer, while rivals Hibs have also been credited with an interest. Halkett is out of contract at the end of the campaign and is expected to move on from the West Lothian club after helping them to back-to-back promotions following their 2016 relegation to League One. While the 23-year-old is flattered by the interest, he insists he’s not in any hurry to make a decision on his future. He said: “There’s a good group of maybe nine or ten of us who have been with the club since League One and the double promotions. So, I think it’s only fair that the boys who have performed well go on and get their moves. “That’s what happens in football and I don’t think you can begrudge anyone if they do move on to bigger and better things. I think it is like the end of an era and we’ve just got to enjoy it while it’s still happening. “For me, it’s a nice compliment to be linked with a team as big as Hearts but it’s something I just let my agent deal with. I am just trying to concentrate on playing football with Livingston.